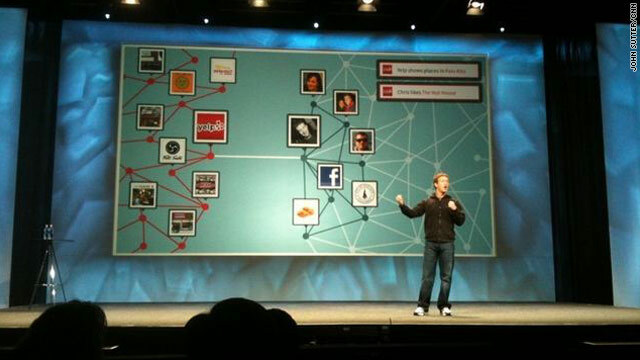 Facebook CEO Mark Zuckerberg called Open Graph "the most transformative thing we've ever done for the web." CEO Mark Zuckerberg: Open Graph is "most transformative thing we've ever done"
San Francisco, California (CNN) -- Facebook on Wednesday announced plans to turn the web into one big cocktail party. "The web is at a really important turning point right now," Mark Zuckerberg, Facebook's co-founder and CEO, said in a keynote address in San Francisco, California. "We're building toward a web where the default is social. Every application and product will be redesigned from the ground up to use a person's real identity and friends." Facebook calls this new social paradigm the "Open Graph," and Zuckerberg called the shift "the most transformative thing we've ever done for the web." The announcement puts Facebook in further competition with other web companies like Google and Twitter, who are also trying to organize and make use of users' preferences. Facebook, which has more than 400 million members, says the Open Graph will make it easier for people to share information about their likes and dislikes all over the internet. The social network will pull information about the websites a person visits, the news stories he or she likes and the music or athletes the person favors -- and share all of that information with a person's Facebook friends. That data will show up on Facebook.com and on other sites. Facebook is launching Open Graph today with more than 30 content partners, including The New York Times, Yelp, the music site Pandora, ESPN and the Internet Movie Database. CNN.com also is a partner. The most tangible way web surfers will notice these changes will be the presence of "like" buttons on sites all over the internet, Zuckerberg said. The buttons will be attached to all kinds of websites, photos and blog posts. If a person clicks the button to indicate they "like" something, that information becomes viewable by that person'sFacebook friends. More than a billion "like" buttons will be scattered all over the web within 24 hours, Zuckerberg predicted. There have been some concerns that integrating Facebook into other web sites would reduce the privacy of people who are browsing the web. In a question-and-answer session with reporters after his keynote at the f8 conference here, Zuckerberg said the changes will not affect the privacy of Facebook users. The Open Graph "shows no new information to anyone than was previously visible," he said. For instance, a person visiting the music site Pandora might see information about bands his or her Facebook friends like -- but wouldn't see info from other web users unless they chose to make their Facebook info public. Some bloggers had expected Facebook to announce a feature that would let Facebook track the locations of its users. Such a feature might allow a person to "check in" at a particular restaurant or bar, and tell that person's Facebook friends about his or her whereabouts. Mobile phone apps like Foursquare have made sharing locations more popular. Zuckerberg dodged questions from reporters on the subject, but didn't say that such a feature is out of the question in the future. "We don't have anything to talk about on that today," he said. Zuckerberg made his remarks during a keynote opening f8, Facebook's annual conference for its developers. He also yielded the stage to Facebook platform product director Bret Taylor, who announced a new programming interface he says will make it easier for outside developers to create applications for Facebook. CNN's Brandon Griggs in Atlanta contributed to this report.